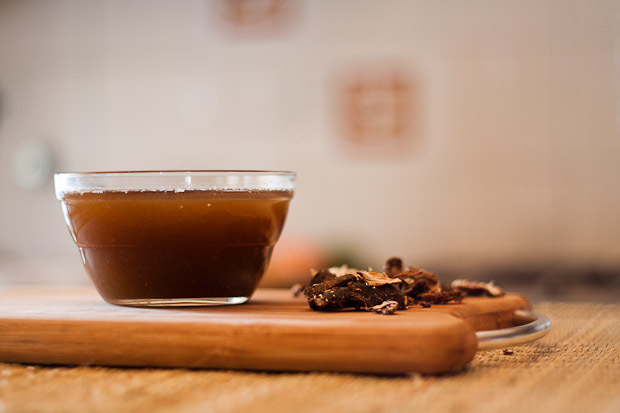 Tamarind Water is a tangy extract of dried tamarind that has been soaked in warm water. While store-bought pastes and extracts are easily available, nothing can replicate the taste and freshness of homemade tamarind extract. Not to mention, you will have control over the amount of water you use, and you will skip all the added preservatives and additives that go into bottled and packaged pastes and sauces. It takes just a few extra minutes, but the depth of flavour this homemade extract lends will make it all worth it. The tamarind water acts a base for many dishes that require a tangy and sour flavour and can be used in Curries and more. To begin making homemade tamarind extract or water, first place the lemon-sized ball of tamarind in a bowl. Warm a cup of water to a rolling boil and pour it over the tamarind. Allow the the tamarind to soak in the water for about 10 minutes. This process helps to soften the tamarind, which in turn helps make extraction of the pulp easier. After 10 minutes, using your fingers, mash the tamarind well into the water until it feels completely soft. This process helps to extract the juice and sourness from the tamarind. Next, strain the tamarind water into a fresh bowl and squeeze out as much extract from the pulp as possible. Next we will proceed to the second extraction of the remaining tamarind pulp. Add another 1/2 cup of water and mash the pulp once again to make more tamarind water. Strain this second extract over the earlier one. The tamarind water is now ready for use in Curries and many other things that require a tangy or sour flavour.